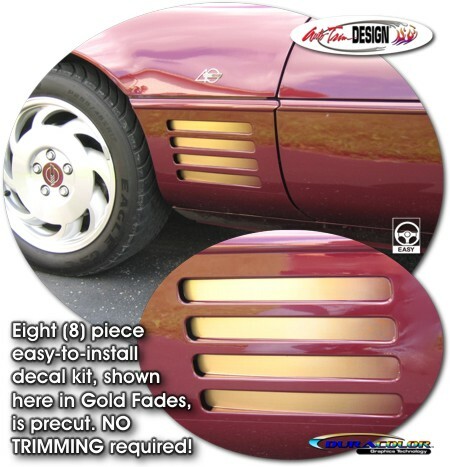 Highlight your '91-'94 Chevrolet Corvette C4's side vents with these unique Vent Graphics that start as solid at the front of the vent and fade to your vehicle's paint scheme to the back. Available in four (4) fade colors. Graphic pieces are covered with a 2.5 mil clear laminate which will protect the graphics from miles of abuse. Each decal measures approximately 9.396"x 1.025" (23.84cm x 2.60cm) each (eight  piece kit). Decals are very easy to install and look great!